“The secret of life, though, is to fall seven times and to get up eight times. The quest for understanding begins now. These 2015 Kazan world championships marked arguably the American team’s poorest performance in the history of the world championships, dating to 1973. When all was said and done, the U.S. ended up with 23 medals, eight gold. The American team’s weakest world championships performance, before this one: 1994, in Rome, with 21 medals, four gold. Take out the two medals in the mixed relays, both new events (gold in the 4x100 free Saturday, silver in the 4x1 medley Wednesday) and the total drops to 21. Those figures stand in stark contrast to the 2013 total: 29 overall, 13 gold. Compare, too, to recent years: 29 and 16 at Shanghai 2011, 22 and 10 in 2009 (Rome again), at the height of the plastic-suit craziness. The only Americans to win individual gold: Katie Ledecky (four), Ryan Lochte (one). That’s it. The other winners: that mixed relay, the women's 4x200 free relay (anchored by Ledecky), the men's medley. The question heading toward a different set of Trials, next summer in Omaha, a few weeks before the Aug. 5 start of the Rio Games, is whether what happened here amounts to aberration or the confluence of potent trends that mean the United States’ long-established role at the top of the swimming world is at significant risk. — It’s indisputable that, owing to the worldwide import of Michael Phelps, world-class swimming has gotten better and, more so, better in more places. Argentina won its first-ever medal here. So, too, Singapore. Akram Ahmed of Egypt took fourth in the men’s 1500 Sunday night. A record 189 nations competed in Kazan, up from 177 at Barcelona 2013. — The Australians are back, and in a big way. The Aussies won one gold in swimming at the London 2012 Games, three in Barcelona. Here, seven gold, 16 overall. — The Brits emerged as a force, in particular 200 free champ James May and breaststroke god Adam Peaty. Their final tally: five gold, nine overall. — The Chinese have both talent and depth, with 13 medals overall, five gold, including Ning Zetao's victory in the 100; he is the first Asian to win swimming's male heavyweight fight. Never mind that Ning is just 22. — Ledecky raced into the history books, winning five gold medals, the 200, 400, 800 and 1500, and that 4x200 free relay. In all, Kazan 2015 featured 12 world records. Ledecky set three of them. For the next year, she will be the face of the American team, which is lovely, because she not only wins, she wins with great class. On Saturday, after her final race, the 800 free, which she won in world-record time, Ledecky met with the press, then as she was walking away from a media clutch, she met up with a gaggle of red-shirted volunteers who squealed in happiness that she would take a picture with them. Ledecky and Kerri Walsh Jennings, the beach volleyball star, are in this way always gracious and polite to seemingly everyone they meet. Maybe it’s something about Stanford, which is where Walsh Jennings went and Ledecky is due to attend. — Phelps, assuming he sticks to his vow to keep doing the hard work that swimming absolutely demands, figures to race for gold in at least three events next summer, the 100 and 200 flys and the 200 individual medley. Swimming this week in San Antonio, at the U.S. nationals, Phelps won the 100 fly in 50.45, the 200 in 1:52.94. Both times would have won here. More pointedly, both victories came amid some smack-talk from the likes of Hungary’s Laszlo Cseh, winner in Kazan of the 200 fly, and South Africa’s Chad le Clos, winner here of the 100 fly. Le Clos won Saturday in 50.56, then declared Phelps hadn’t gone that fast in years. Oops — just hours later in San Antonio, here came that 50.45, Phelps' fastest-time ever in the event in a textile suit. Gentlemen, we are not here to tell you what to say, or not, but history has shown repeatedly that if Phelps puts in his training blocks, you mess with fire when you blow this kind of smoke. Ask the likes of Ian Thorpe, Ian Crocker and, famously, Milorad Cavic. When Phelps has someone he can — in his mind — target, it has not gone well, swim-wise, for said target. — Lochte's victory in the 200 IM made for his fourth world championship gold in a row in the event. At the same time, he finished fourth in the 200 free, same as in 2013 and 2012. Lochte is for sure Mr. Reliable on the relays, where the American performance here — without Lochte or Nathan Adrian, the U.S. men failed to qualify for the 4x1 finals — showed just how valuable he is. At an Olympics, the 200 IM traditionally comes on the same night as the 200 back, and thus it will be in Rio, on Thursday, Aug. 11. At previous Games, Lochte has opted to try to pull off that grueling double. In London, he took third in the 200 back, then silver — behind Phelps — in the 200 IM. -- Connor Jaeger broke the 11-year-old American record in the 1500 on Sunday night, going 14:41.2. Larsen Jensen had gone 14:45.29 at the 2004 Athens Games. — This U.S. 2015 team was picked a year ago. Was that a good plan? No Caitlin Leverenz, Allison Schmitt, Jack Conger or others who might have made a difference. — The U.S. sprinting program, excluding Adrian, needs someone to step up, and big time. No one did here. — Tyler Clary had won a medal of some sort at the 2009, 2011 and 2013 worlds; he is the 2012 London 200 back gold medalist. Here? No medals. -- Jaeger: That 14:41.2 earned him silver, 1.53 seconds behind Gregorio Paltrinieri of Italy, in 14:39.67. China's Sun Yang, the world record-holder and pre-race favorite, did not swim, saying he felt a heart problem -- literally his heart, not his desire to race -- before the call to the blocks. Jaeger's other Kazan races: fourth, 400 free; fourth, 800 free. — The relays: That the U.S. men missed out on the finals of the 4x1 free is, in a word, inexcusable. The men’s 4x2 free relay finished second, the first time since 2004 the Americans had not won at a worlds or Olympics (the British took first, with Guy making up a 1.63-second deficit and then some, touching 42-hundredths ahead of Michael Weiss). In 2001, the U.S. men won no relays. That had been the only time ever at worlds history there had been no U.S. men’s relay gold. Thus the stakes were high for Sunday night’s medley, the Americans opting to lead off not with Matt Grevers — gold medalist in the 100 back at London 2012 and Barcelona 2013, silver medalist in the event at Beijing 2008 — but with Ryan Murphy, who threw out a 52.18 in the mixed medley relay heats. The thinking? Larkin won the 100 back in 52.40. Murphy’s 52.18 made for the fourth-fastest time ever in the event. Larkin kept the Americans close, third, with a 53.05; Larkin turned the race over with the Aussies in first, in 52.41. On the third leg, butterfly, Tom Shields put the Americans in first; Adrian held on to bring the Americans home to gold in 3:29.93. The split for Australia's Cameron McEvoy, who was closing: 46.6. — Dana Vollmer is back in training. She won the women’s 100 fly in London. Can she, now a new mom, make it all the way back to the top of the world stage? — Missy Franklin? Ohmigod, she did not win every single thing she entered. What?! Franklin did, for instance, come through, and in a big way, in that mixed 4x1 free relay, anchoring the team to victory and a world record. As Franklin heads back home to Colorado, however, it’s clear that Ledecky is now the 200 free boss, so there’s that. For another, Franklin was clearly not her best self here. She faded significantly on the last lap of Saturday’s 200 backstroke, a race she has owned for years. Summoned to swim the backstroke leg of the women's medley Sunday night, she managed 59.81, fifth; the Americans would end up fourth. Franklin said Saturday she was “proud” of what she had done here, given the work she had put in over the past two months; she said she looked forward to seeing the results of a full year of going at it hard. Plummer, meanwhile, has been chasing Rio since missing out on London 2012 by 12-hundredths of a second. On Sunday, in the 50 back, a non-Olympic event, Plummer finished eighth, of eight, in 24.95. Camille Lacourt of France won, in 24.23; Grevers took second, in 24.61. "The trick would be to find which few of them had the potential for raw power, the nearly superhuman stamina, the indomitable willpower, and the intellectual capacity necessary to master the details of technique." The deadline in this instance is already marked on swim calendars: the first day of the U.S. Trials in Omaha. It's Sunday, June 26, 2016. Wouldn’t American track and field be so much better, goes the mournful refrain, if only there were a sprint champion everyone could actually believe in? Who wasn’t, you know, doped to the gills? Maybe Kendal Williams doesn’t go on to run 9.57. But now that he has won the men’s 100 at the world juniors in Eugene, Oregon, maybe it’s time, too, to celebrate the very sort of young athlete everyone says they really want — but then hardly gives more than a moment to when he does exactly what they say they’re begging for. In Eugene, Williams defeated favorite Trayvon Bromell in the 100, running 10.21 to Bromell’s 10.28. They then teamed up — along with Jalen Miller and Trentavis Friday, the Eugene 200-meter champion — as the Americans won the 4x100 relay. First things first: of course 10.2 is not going to win anything at the Olympics. These were the juniors. Nonetheless, Kendal Williams has world-class potential. He is about a month shy of his 19th birthday, is about to start at Florida State and is already running 10.2 without lifting weights in high school. Why no weights? Because he went to Stanton College Preparatory School, one of Jacksonville, Florida’s, most academically renowned institutions, dating to the 1860s, when it began serving the African-American community. Second, of course it’s always dangerous when it comes to the issue of performance-enhancing drugs to know absolutely, positively for sure if someone is clean. In the case of Kendal Williams every shred of evidence would suggest he is, as the old advertising saying goes, 99 and 44/100 percent clean. Never mind the tests — and, yes, he has been tested, and the tests are clean. It’s more, way more, than that. Kendal Williams’ older brother, Ken, 26, and his wife, Kimberly, are expecting their first child, a boy, in November. His dad, Ken, and mom, also named Kimberly, have been together for 29 years. They are high school sweethearts. He is an AT&T project manager; she is an AT&T finance manager. Ken Williams’ mother -- that is, Kendal Williams' grandmother -- passed away three years ago; Kendal's grandparents had been married for 58 years. Ken William’s parents met in college at Florida A&M. Kimberly Williams’ parents met in college at Bethune-Cookman. 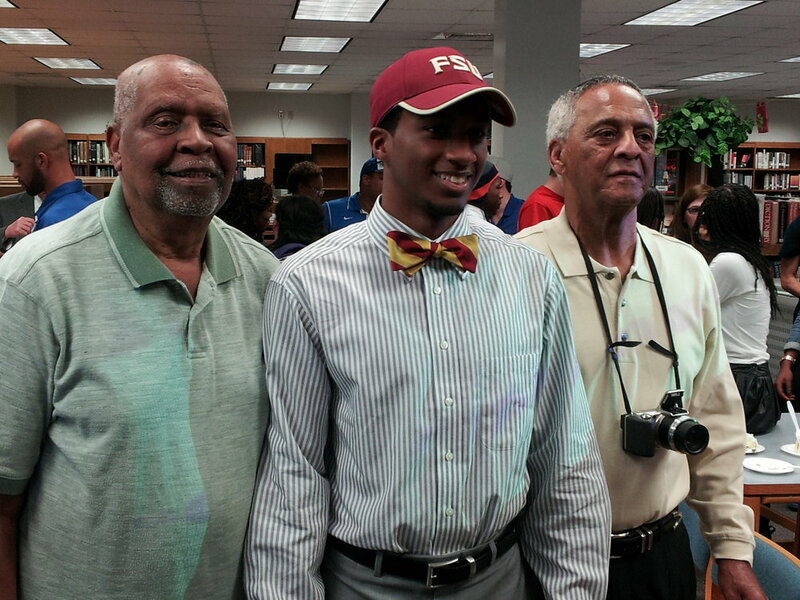 Both of Kendal Williams’ grandfathers are graduates of Stanton Prep. “My wife and I both came from two-parent homes and they came from two-parent homes. That’s been important to us,” Ken Williams said. “That’s been important to us, to raise our kids and give them that foundation. You don’t always see that these days. Athletic talent runs through the extended family. James Loney, who now plays for the Tampa Bay Rays, is a cousin. Kendal Williams’ speed was obvious way back. In eighth grade, Isley’s son, Merrick, and Kendal ran a 100; halfway, Merrick was perhaps three or four meters ahead; by the finish, Kendal was three or four meters up. May happened to be at the meet that day. To be on May’s team would be a commitment for the Williams family — a 40-mile drive. “To show you the athleticism, the first time I showed [Kendal] how to long jump, he went 21 feet,” May said. This was March of Kendal's eighth-grade year, he said. With Kendal, Isley and all of six other kids, May’s team would later go on to win the middle-school state meet. “I’m always suspect of major leaps,” May said, meaning in times, which is why Kendal Williams’ progressions are further evidence of regular development. In the 100, for instance, the progressions read like this: 2011 10.46, 2012 10.37, 2013 10.18, 2014 a personal-best 10.21. The 2012 and 2013 times were both wind-aided, both readings slightly above the allowable 2.0 meters per second. The winning time in Eugene was run into a slight headwind, 0.6 meters per second. No question it is the real deal. “Most sprinters run better in heat. He ran better in cool weather. He ran a PR in that weather,” May said.